Schroon Lake; Clarence J. (Zeke) Zabriskie 92, went to be with his Lord and Savior Saturday May 24, 2014. Clarence was born August 13, 1921 in Paramus, N.J., the son of the late Clarence J. and Dorothy R. Robinstein Zabriskie. Clarence was married to Elizabeth Meester Zabriskie (who predeceased him June 19, 2012) for 67 years. They originally resided in Mahwah, N.J. and moved to Schroon Lake in 1980. They lived in Florida from 1990-2006. They then moved back to Schroon Lake and resided by their daughter, Lisabeth Vander Wiele (Keith). Other children include Paul Zabriskie (Paula) of Stuart Fl. and Sharon Van Alstine (Edward) of Lake Ariel, Pa. Clarence has nine grandchildren and twenty four great grandchildren. Clarence was a veteran of WWII having served in the USAF from 1942-1945. He was employed by the Curtis Wright Corporation in NJ for 24 years as an aircraft jet engine test and research engineer. Clarence attended Mountainside Bible Chapel in Schroon Lake and Grace Bible Fellowship in Olmstedville. 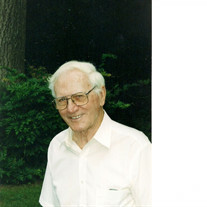 He loved his family and all his grandchildren and great grandchildren. He enjoyed dogs, horses and airplanes. Special thank you to Dr. Schwerman, for his many years of care, and also to the staff at Heritage Commons in Ticonderoga, for their compassionate care. Funeral Services will be conducted Wednesday May 28, 2014 at 7:00 PM at the Edward L. Kelly Funeral Home 1019 US Rt. 9 Schroon Lake, NY. Friends may call at the funeral home from 6:00 until 7:00 PM. The family suggests memorials take the form of donations to Mountainside Christian Academy, Schroon Lake, NY 12870. To express condolences please visit www.edwardlkellyfuneralhome.com.